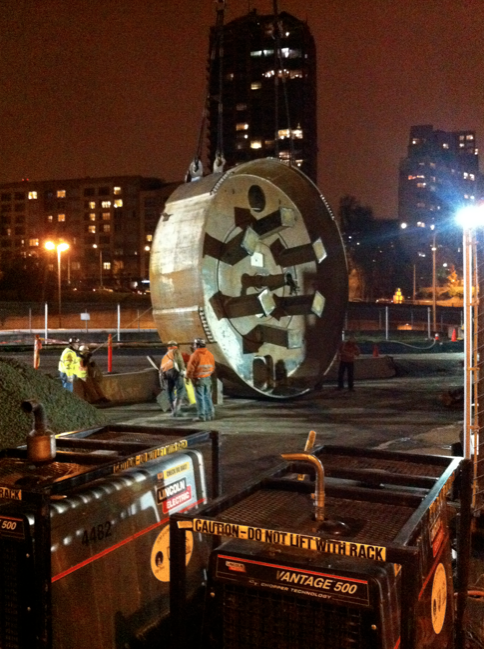 Brenda, or at least part of the 21-foot-tall, 679,500-pound boring machine that just completed the first of two tunnels from Broadway to the Pine St wall of the downtown transit tunnel, rested above ground Thursday night. She’ll be loaded on a truck and carried back to the top of Capitol Hill where, soon, the machine will start another 4-month trip to dig a second tunnel along the same path. They should have called her Sisyphus. We wrote about her journey recently here. Thursday night, a crew of about 10 workers positioned the cutting head of the giant machine after a large crane hauled it to the surface. Unlike the way these machines start their trips, the end was mostly quiet and subdued. 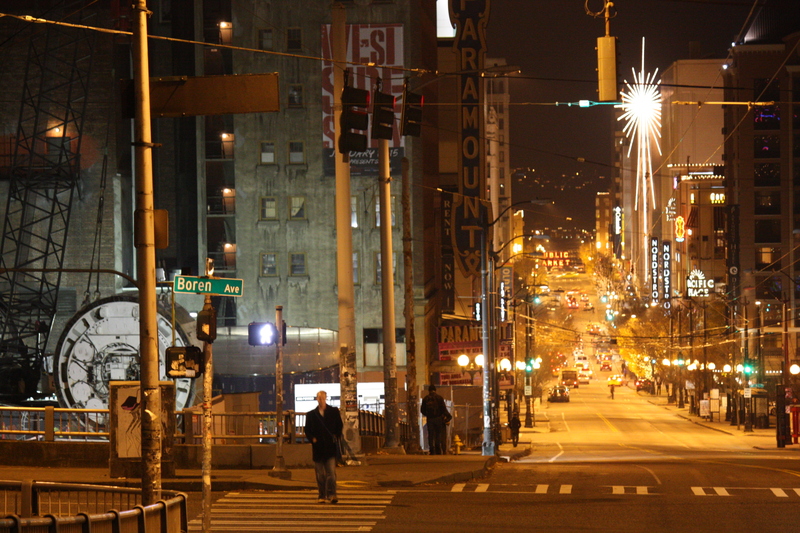 A foreman in a safety yellow jacket and hardhat hustled it back up Pine past the bars and nightclubs toward Broadway once this phase of getting her ready for her return trip was complete. Someday, he’ll be able to ride the subway. With one tunnel in place and the others taking shape in Montlake, 2016 doesn’t feel quite so far away. Thanks to @eric_lobdell for the tip.